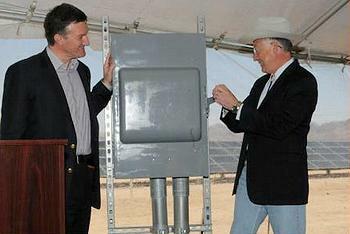 PRIMM, Nevada, May 8, 2012 (ENS) – The first utility-scale solar energy facility on U.S. public lands started delivering power on Monday with the flip of a switch by Secretary of the Interior Ken Salazar. Located 40 miles south of Las Vegas, the Enbridge Silver State North solar project is a 50-megawatt plant that will use thin film photovoltaic technology to generate enough power for about 9,000 Nevada homes. Owned by Enbridge, a Canadian energy company based in Calgary, Alberta, the project employed some 380 construction workers during peak construction and 650 people over the course of the project. First Solar developed and constructed the facility using its advanced thin film photovoltaic modules, and will operate and maintain the project for Enbridge, which acquired Silver State North in March. NV Energy has a power purchase agreement to sell the solar project’s electricity to the Nevada market. By harnessing the area’s abundant sunshine, the Silver State North facility generates electricity with no air emissions, no waste production, and no water use. The plant, using technology with the smallest carbon footprint of any photovoltaic solar system, displaces about 42,000 metric tons of carbon dioxide annually – the equivalent of taking 8,000 cars off the road. The project site is located near a major transmission hub. Constructed on 618 acres of public land managed by the Bureau of Land Management, the solar project underwent full environmental analysis and public review. The Bureau of Land Management worked with federal, state and local partners, members of the environmental and conservation community, and stakeholders to protect wildlife at the project site. First Solar and the BLM worked with the U.S. 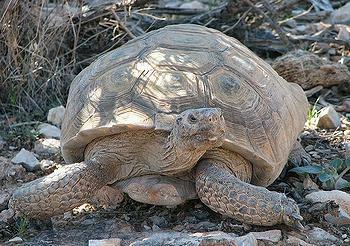 Fish and Wildlife Service to develop a relocation plan for desert tortoises found on the site. The desert tortoise, Gopherus agassizii, is the official reptile in the states of California and Nevada. Listed as a threatened species by the state and federal governments, the number of desert tortoises has decreased by 90 percent since the 1950s. An estimated 100,000 tortoises remain in the Mojave and Sonoran deserts. The BLM also required a natural color palette for painted structures and controlled night lighting, designed to reduce visual impacts on the local community. “This is a model of industry and government working together to strengthen local economies, generating good jobs and affordable, reliable and sustainable power,” Salazar said. U.S. 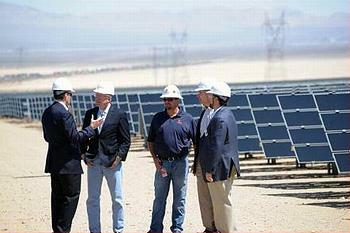 Senator Harry Reid of Nevada is pleased with the new solar development. “I commend Secretary Salazar and the Obama administration for their commitment to Nevada’s clean energy future by helping to move the Silver State North Solar Project quickly through the environmental review process,” said Reid. Salazar says the new solar generating project is part of the administration’s broad commitment to expanding production of all sources of American made energy, including from renewable sources, such as wind and solar, which has doubled in the President’s first term in office. Before the Obama administration took over in January 2009, there were no solar energy projects permitted on public lands. Since then, the Department of the Interior has authorized 29 large-scale renewable energy projects on public lands, including 16 solar facilities, five wind farms, and eight geothermal plants. When completed, these projects will provide more than 6,500 megawatts of power to communities across the West, enough to power more than two million homes.